The Axenstrasse is one of the most beautiful main roads in Central Switzerland. It is about 11km long. “On peak days there are up to 14 000 vehicles” (p1 Ref. 1). It is a two-way road with no structural separation of oncoming traffic. On the days I drove this road, the traffic volumes seemed not too different from the 18km-long SH2 drive between Paeroa and Waihi through the Karangahake Gorge, which has a daily traffic volume (DTV) of 8,374, of which 10% is heavy traffic. This is a great drive for the passenger. Being the driver, my job was to watch my speed and position in the lane. In Switzerland, as in most places in the world, high traffic volumes are needed to justify the building of expensive, high-speed roads. Page 5 of Ref. 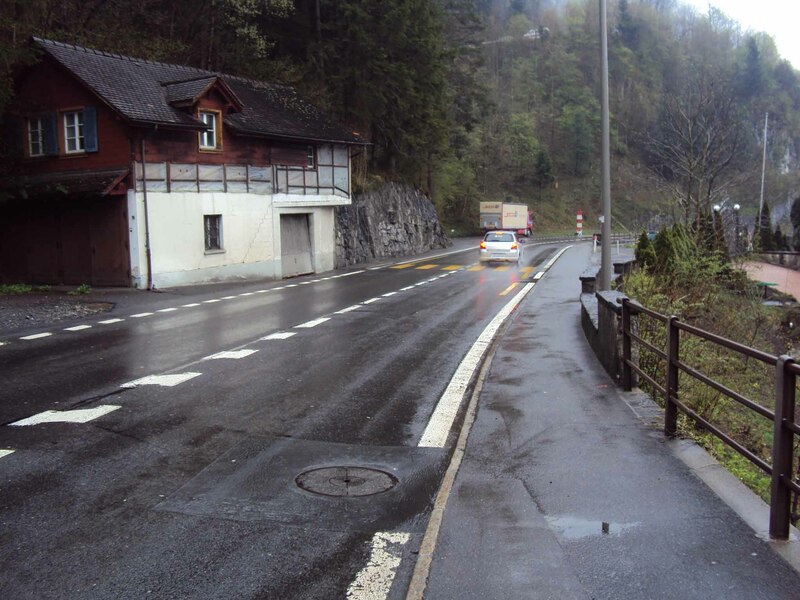 1 below explains why this Swiss road allows oncoming traffic that is not physically separated from the other lane as follows: “a DTV 20,000, a Truck percentage of more than 15 % requires two-tube systems”. Axenstrasse also has a history of many crashes. “Accident Statistics 1990-2015: 547 traffic accidents (5 deaths, 59 serious injuries, 203 slight injuries, property damage amounting to approximately 5 million Swiss francs)” (p15) http://www.axen.ch/fileadmin/dateien/dokumente/u_20160303_axen-initiative_praesentation.pdf . To benchmark this to New Zealand’s SH2 Karangahake Gorge, this report from http://www.robertnz.net/pdf/Karangahake.pdf Does anyone have up to date crash numbers? Here is the postcard, Tellskapelle. 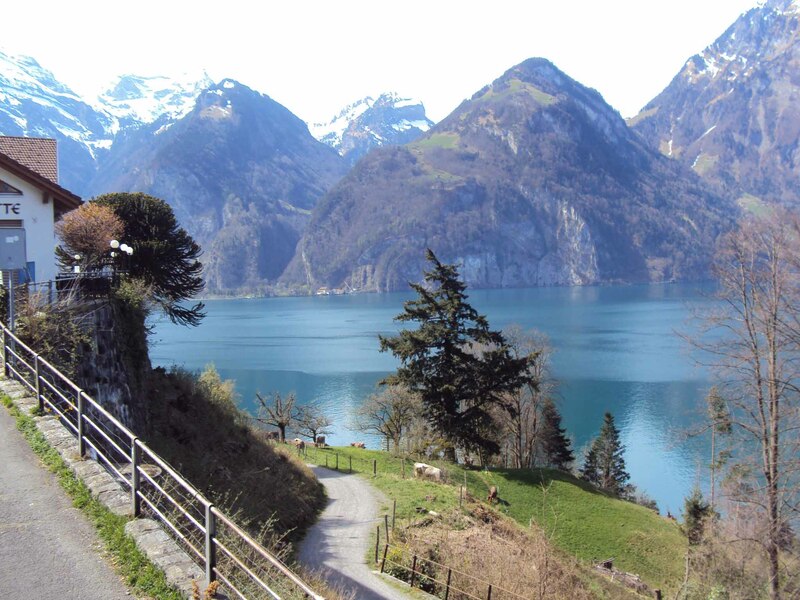 Magnificent views of beautiful mountains, lake, and Swiss brown cows with bells. And below is another post card, of Morschach. We can see pedestrian crossings on this road; something we don’t see anywhere along SH2 in Karangahake Gorge, even when there are recognized access points and places with high volumes of pedestrians such as the Karangahake rest area and Waikino Tavern. A more serious question is what speed limits would Swiss transport engineers use on a road like SH2 through Karangahake Gorge. NZ highway engineers have set the speed limits at 80kph with advisory speeds of 45 – 55 – 65 kph. Driving the 11 km between Fluelen and Brunnen the speed limit does not go above 80km/h, and there are no advisory speeds. Where the road is not suitable for 80 kph, the legal speed limit is lowered to 60 km/h for reasonably long distances, making it a less hurried drive. There are also reductions to 50 km/h down to 30 km/h in urban areas, encouraging people to stop and spend locally. C. Locations of speed signs.